Our unbreakable wine glasses are made from Eastman Chemical's proprietary TRITAN(TM), an advanced plastic composite, which in rigorous testing has been proven equal or superior to other plastics, acrylics and polymers for durability, clarity, and food safety. Our glasses are lead-free, BPA-free and EA-free. YINGANG Rocks Whiskey Glasses are perfect for connoisseurs who enjoy their single malts and small batch bourbons "neat" or on the rocks; sometimes with a splash. Many of these refined sippers abhor mixers, and they don't want cavernous 10 or 12 ounce glasses. 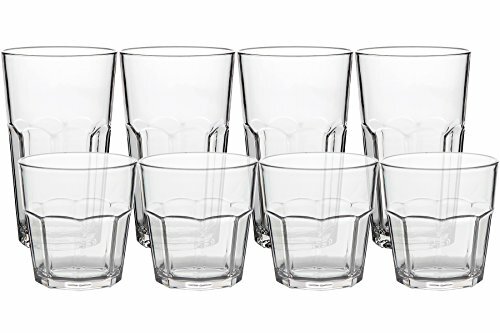 But no matter how you mix your favorite cocktail, our unbreakable glasses have perfect 9 ounce capacities, and octagonal design on the half part of bottom, with a strong visual aesthetic. Our Rocks Whiskey Glasses are for people who have everything. They make a unique and tasteful gift for Scotch & whiskey lovers, business associates, and party hosts, and they are perfect for wedding, birthdays & anniversaries, promotion parties, housewarmings, and family vacations. Not only are our whiskey glasses impressive to look at, but they are also portable. These glasses are 3.27" high, 3.11" wide at the rim, and weigh 4.25 ounces. They consume very little luggage space and they will never break, and they are perfect stackable, so pack one permanently in your favorite bag. Wherever your travels may take you, our rocks glass will help make you feel at home. MADE WITH TRITAN - Developed by Eastman Chemical, Tritan is a clear, rigid polymer that outperforms all other acrylics and plastics in food-based applications. Tritan looks and acts like fine glass and emulates its best features, but unlike glass, it is unbreakable. DURABILITY & EXCEPTIONAL VALUE - Our Rocks glasses can be dropped from a bar or table onto a tile, concrete or hardwood floor without chipping, cracking or breaking. They will not require replacement for many years, and that means exceptional customer value! GO ANYWHERE VERSATILITY - These versatile glasses will add style and sophistication to any home barware collection, and they are also great for picnic, pool, beach and patio. Wherever your travels may take you, take them along. They will make you feel right at home. SAFETY & COMFORT - Our glasses are guaranteed BPA-free, and extensive testing has proven them to be 100% food-safe. Smoothed rims prevent lip irritation, and octagonal design on the half part of bottom, with a strong visual aesthetic. PRODUCT CARE - Our Whiskey glasses are rated to 200? Fahrenheit. They are dishwasher-safe, and a simple wipe with a soft cloth will enhance their brilliance and clarity; REMEMBER - Never use scouring pads on any type of plastics. If you have any questions about this product by YINGANG, contact us by completing and submitting the form below. If you are looking for a specif part number, please include it with your message.